Our Voila mattress review gives our experience with this new mattress on the market that combines two different mattress design elements – pocketed innerspring coils and memory / gel / latex foam technology together to provide a “best of both worlds” type feel. The Voila has a extremely soft cover that is made of mesh and fabric and helps provide breathability and assists with cooling as well. The Voila Firm comes in around a 7/8 out of 10 on the firmness scale (10 being firmest.) As always, firmness is largely weight dependent, as I compressed the top layers more than Kaye did and felt the firmer support layers underneath. She felt it was a little softer than I did, but that is because she weighs half what I do and the top layers support her lighter weight instead of relying on the lower layers to do so. The Voila Plush is more of a 5 out of 10 on the firmness scaled (10 being firmest). The thicker top foam layers on the top provide a very plush and comfortable sleeping surface. he pocketed coil construction provides bounce-back and response during sleeping. In terms of support, the Voila does a very good job of providing good support and weight distribution from the combination of foam layers and the pocketed coil construction. The latex and visco foam top layers work well together to provide just the right amount of support without being too firm and causing pressure point pain. In addition, the lower pocketed coil layer provided the response and bounce that innerspring mattresses are known for. Both Firm and plush models offer great support, just vary naturally in terms of the firmness that they offer. Personally, I liked the softer model but due to my weight I did compress it quite a bit which is common for me. The company recommends the Firm version for heavier sleepers. The Voila is quite comfortable and does a very good job at providing a great night’s sleep. The foam layers provide enough give to allow the mattress to mold to your body, but at the same time not causing you to feel stuck in it. The bounce and responsiveness from the hybrid pocketed coil construction and latex provides a good amount of pushback and allows you to adjust easily between sleeping positions during the night. The softness of the cover combined with the initial soft response from the latex and gel foam layers really makes for a comfortable nights sleep, and this was shared by both of us. I prefer softer mattresses than Kaye, so naturally she liked the Firm better than the Plush. In this case we really didn’t get one that was universally shared by both of us, so the medium firmness would most likely have been a better choice for us as a couple. This hybrid mattress does a good job at minimizing heat buildup during the night due to the latex and gel top layers used in the construction of the mattress, and has temperature regulating features. We did not feel any discomfort or stickiness that is often the case with foam mattresses, as the utilization of latex and gel helped prevent this. We would rate the Voila as above average in sleeping cool, and is significantly better than most hybrid and memory foam mattresses in this regard. The Plush model was a lot softer than the Firm and thus caused me to sink much more with my heavier weight. Kaye did not experience this amount of sinkage as she weighs half of what I do. We did not experience the common phenomenon of her “sinking in a hole” or rolling towards me from the unequal weight difference on the mattress with the Firm, but we did a little bit with the Plush model due to its softer construction. Edge support was good with the this mattress due to the reinforced edge support layer with the mattress. The Voila did a great job of not making us feel like we were rolling off the sides. There was a decent amount of motion transfer when I adjusted positions during the night when sleeping on the Plush, which again is to be expected from the weight differential between myself and Kaye. This is often a trade-off for us with a less firm mattress, and the Firm Voila is better at motion transfer than the Plush. 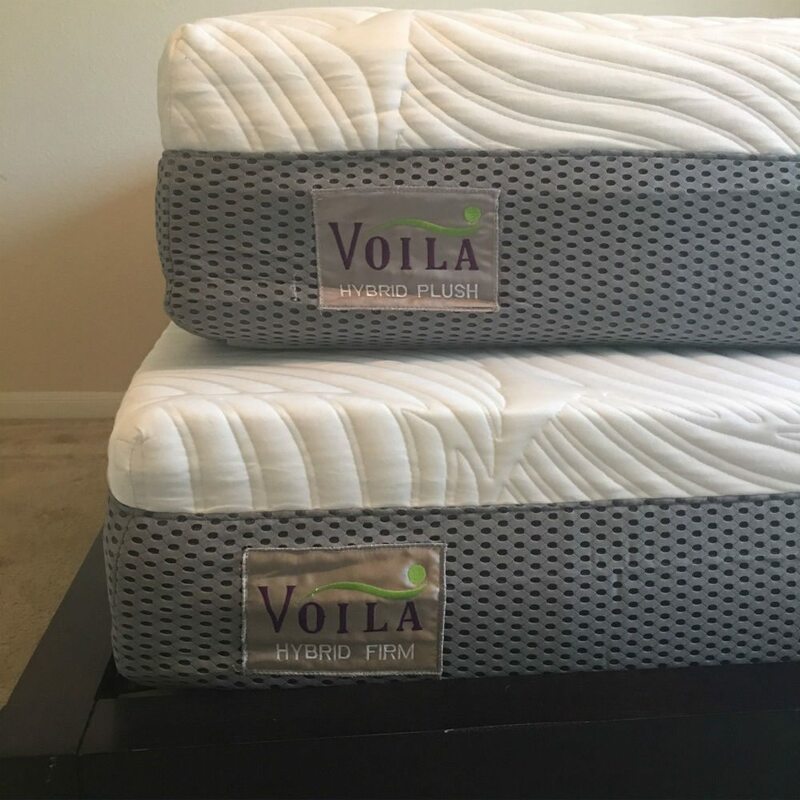 We did not experience much smell or odor when we opened the Voila as it only has a small foam component compared to the other mattresses that we have reviewed. Again, this is primarily a problem with all foam construction mattresses and the Voila only uses a few layers of foam in the top comfort layers so there wasn’t any significant off-gassing smell. Voila is pretty standard when it comes to their warranty and support offerings. Most mattresses in this category share about the same offerings in terms of sleep trials and warranty, and Voila is no exception here. The Voila mattress is an excellent and innovative hybrid latex, gel, and visco foam mattress combined with pocketed coils that provides the benefits of both memory foam type mattresses and innerspring coil mattresses. The Voila provides the comfort and cooling benefits of latex and memory foam with the bounce and responsiveness of coil construction in a comfortable, modern design with firmness options for all sleepers. The Voila is a great mattress for couples in that the bounce provided by the coils enables better romantic response ;), while providing the comfort and coolness that latex and memory foam technology is good at. We feel the Voila mattress is a very unique and innovative mattress that will appeal to all sleeping positions. It is great for both single sleepers and couples and we recommend this mattress for someone that is interested in the feel of innerspring but also wants the comfort of memory foam as well. Hopefully our review of the Voila mattress helps you make a decision on your next mattress purchase!